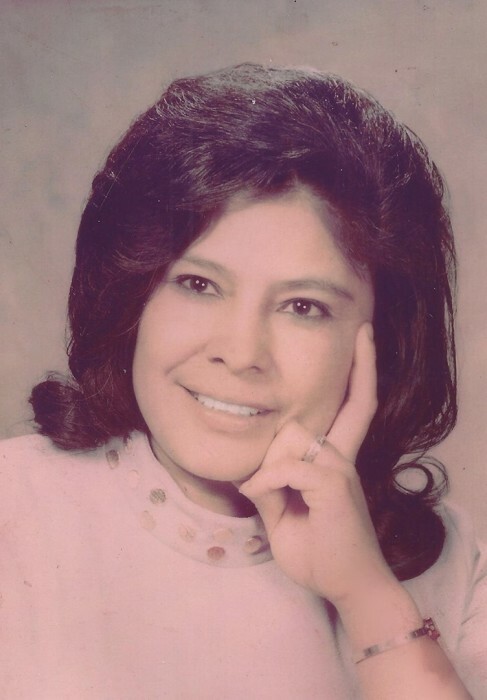 Alberta Salazar, 85, of Amarillo, died Wednesday, January 23, 2019. Funeral Mass will be celebrated at 2:00 pm Monday at St. Laurence Cathedral, 2300 N. Spring St. with Fr. Shane Wieck officiating. Rosary service will be at 5:00 pm Sunday at Cox Funeral Home, 4180 Canyon Dr. Burial will be at Llano Cemetery. The family will have a gathering at God of Wonders Fellowship, 1924 S. Polk following the committal service. Alberta was born December 28, 1933 in Yeso, New Mexico to Stanley Hernandez and Carmen Levario. She worked at Austin Middle School for many years. She also worked for Villa Inn. Alberta was a talented quilter. She spent several years enjoying her grandchildren as a stay-at-home grandma. She will be greatly missed by those who love her. She was preceded in death by her parents; a daughter, Carmen Murray; a son, Enrique “Henry” Hernandez; three brothers, Jackie Hernandez, Joe Peter Hernandez, and Raymond Guzman; a sister, Patsy Beehler; and two grandchildren, Evangelina Aguilar and Antoinette Aguilar. Survivors include her husband, Fred Salazar; a son, Tony Aguilar and wife Adela of Albuquerque, NM; three daughters, Patsy Galan and husband Caesar, Bell Valverde and husband Chris, and Frances Salazar-Potts and husband Joseph all of Amarillo; eight brothers, Johnny Hernandez and wife Virginia of Las Vegas, NV, Jerry Hernandez of Grand Rapids, MI, Rosendo Hernandez and wife Rosie, Thomas Hernandez, Tony Hernandez and wife Emilia, Ruben Guzman, Jessie Guzman and wife Rosa all of Amarillo, and Manuel Guzman and wife Donna of Florida; four sisters, Mary Romero of Colorado, Annie Little and husband Tom, Lucy Garcia and husband Benny all of Amarillo, and Lupita Hampton of South Carolina; 12 grandchildren; 22 great-grandchildren; and four great-great-grandchildren. The family suggests memorials be made to St. Laurence Cathedral, 2300 N. Spring St. Amarillo, TX 79107.